Connecticut Sun fans often have former UConn players returning home and getting nice ovations from what used to be their home crowd. They did it again Wednesday when Tina Charles and three other UConn alumni visited the Mohegan Sun Arena as members of the New York Liberty. But Friday night is different. Friday night marks the (potential) latest return by Diana Taurasi. The WNBA's all-time leading scorer, who also recently set the league mark for made field goals, and her Phoenix Mercury come to Uncasville. The Mercury, who have already beaten the Sun twice this season, have lost the first two games of a four-game road trip, with illness forcing Taurasi out of Tuesday night's 101-72 loss at Dallas in the first quarter. That left her questionable for Friday. 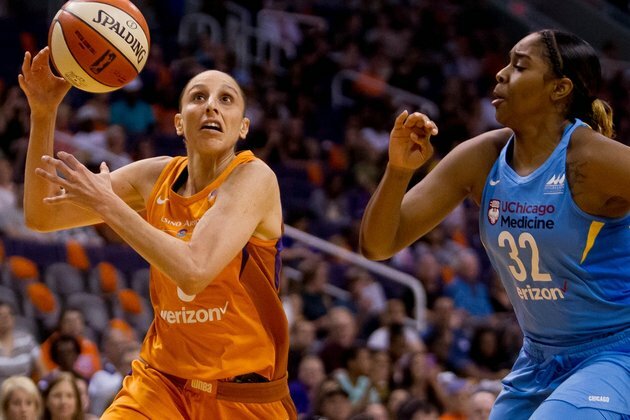 Despite the two losses, Phoenix, led by the 1-2 punch of Taurasi and inside presence Brittney Griner, is 14-7 and in a battle for the top spot in the league. Wednesday, the struggling Sun suffered a last-second loss to the Liberty -- falling to 10-10 with their ninth loss in their last 12 games. Taurasi, averaging 19.6 points per game this season, has 44 points in two games against the Sun this season. She is a three-time league champion, a four-time Olympic Gold Medal winner and six-time European champion. She was given the nickname "White Mamba," by Kobe Bryant, known as "Black Mamba." Recently, Deandre Ayton, the No. 1 overall pick in the NBA draft, taken by the Phoenix Suns, was thrilled to meet Taurasi. "I was freaking out," he said. "Because she just came over to me while I was working out, pumping some iron, you know? And she just like, was saying, 'Hello and great to have you.' I was like star-struck. I was speechless. She's the Michael Jordan of the WNBA." The Sun -- who got Alyssa Thomas back after a 10-game absence (shoulder) and Courtney Williams back from a four-game absence (personal reasons) and also debuted the newly acquired Layshia Clarendon -- have had a heavy road schedule to deal with. They started a closing stretch of 11 of their final 15 games at home. "What people fail to realize is we're excited that (the injured players are) back, but, at the same time, there's still an adjustment," Chiney Ogwumike said after Wednesday's loss. "This has been the year of adjustments. "We started the year strong and then we lose AT and then we lose Courtney for a stretch. People have been dinged up here and there. So we're constantly making adjustments." The Mercury have been dealing with the loss of Sancho Lyttle, who suffered a season-ending knee injury July 2.